Languages will open doors to you in the future! When learning languages not only are you learning to speak and understand a new language, but you also learn communication skills, team work, flexibility, being outside your comfort zone, perseverance, memory skills; – life-long skills much appreciated by future employers. 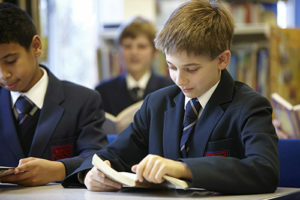 Years 10 and 11 Students continue with one or two The study of one language is compulsory for GCSE. 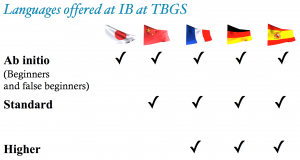 At KS5 there are many opportunities to continue with languages through the International Baccalaureate. All students taking the IB course study at least one language as part of their IB Diploma and the two-year IB course enables us to offer a range of courses in the following languages. The IB Diploma promotes the study of languages among the young people of today because we live in a world where language skills are of great importance. The Modern Languages Department also gives students the opportunity to experience other cultures and languages during the International Week of Languages: Polish, Japanese, Greek, Italian, Swedish, Arabic, Welsh, Swahili, Japanese, Portuguese, Basque and Catalan. G&T Y10 and all IB students also take part in a Languages Day run by Oxford University Professors to give them an insight into how far languages can take them and how languages can play an important part in their future careers. The Department offers a range of trips in which students can put into practice their language skills: Spanish, French and German language courses for KS4 and KS5, trips to Barcelona and Cologne in Y9, and to China for KS4. Sixth Form students are also encouraged to do one week of Work Experience abroad where they can experience using their language skills in the workplace. We work closely with an international company: Centrax Gas Turbines. Languages are an extremely important part of the company as they have branches in many countries around the world and it is important for their engineers to be able to communicate in other languages. Centrax sponsors our Linguist of the Year Cup, awarded every year to the best GCSE dual linguist. Work Experience abroad Opportunity to do one-week Work Experience in France, Germany and Spain. The Department also runs exchanges to these three countries as well as a trip to China. Students are also given advice about doing work experience in the summer months after they finish Year 12. Continue with your language learning: – you can’t go wrong! No matter which career path you choose in the future, keep your languages going. They will come in very handy one day both for work here in UK and abroad.